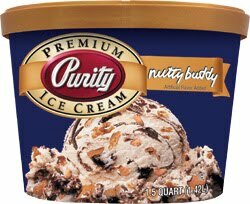 Question: Anyone ever had Purity Dairies ice cream? You know, it really is scary to think about how many dairies there are out there making up the multi-billion dollar U.S. ice cream industry.... actually, it's not scary, it's more sad, sad as in I'll never get to experience them all! I'm sure they have stuff like that were you live, just not the same exact one. I've grown up on Purity ice cream. Its good, but Blue Bell blows it away. @Danielle: but I must try them all! @Meg: ha! good to know! I've tried Purity Ice Cream. (I live in TN and visit Ky regularly.) I actually like their Nutty Buddy flavor as good as (if not better than) Ben and Jerry's and Haagen Daaz versions of the same flavor. There were a lot of bits and the cone bits inside seemed crisper than either of the other varieties, but considering I live closer to the source it's not surprising that the Purity flavor would be fresher than the others. They have a limited number of flavors, but they're pretty good quality and the price is less than half of their pint sized competition. Always a plus. I'd recommend them to anyone in their selling area. One thing I like about purity is that they sponsor an ice cream competition in Nashville every year where people make their own flavors of ice cream. The ice cream gets judged by a panel then distributed to the public in an all you can eat fashion (for a fee, it's a charity event). The winner of the competition gets their ice cream made into a Purity flavor that's sold in stores. I think the winner this year was called Coconut Waltz. And I'd totally LOVE a food network show about different ice cream dairies and small batch producers. Maybe we should start a petition. Ha Ha. There was a really cool episode of Foodography on the cooking channel a few months ago all about ice cream.